An Early Access digital card game that kept us coming back for more. 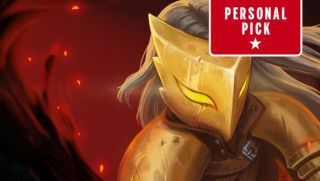 Slay the Spire’s Ironclad character starts off with a bunch of Strike cards. A Strike costs one energy and deals six damage to an enemy. It’s pants. You can string a bunch of Strikes together to take out basic enemies, but soon you will need to collect new cards from their corpses and, should the opportunity present itself, get rid of those old Strikes forever at a shop. It’s all about efficiency. Every time you draw a Strike at the start of your turn, you’re not drawing a more powerful attack. Once you get to know what cards might drop, sometimes it’s worth skipping the card loot phase entirely. Do I really need another Cleave? It’s good at clearing mobs, but I have lots of cards that inflict the Vulnerable status, and I can take Dropkick instead to keep drawing cards. If I’m lucky some powerful cards will drop, like Demon Form, and I’ll fight my way through three major bosses and beat up on the evil Heart of the Spire on the top floor. Slay the Spire is a clever, accessible deckbuilding roguelike hybrid with terrific card design and a gripping ‘just one more run’ pull. It isn’t out until January 2019, technically, but it’s already brilliant enough to earn a personal pick in this year’s GOTY awards. Throughout 2018 the devs have introduced fun rules modifiers and daily runs to keep the game in my ‘recently played’ Steam bucket. Slay the Spire isn’t the prettiest digital card game, but the presentation does a great job of demystifying deckbuilding. Games like Ascension bombard you with cards, resources, and enemies. Slay the Spire gives you digestible choices: pick a path up the spire, win a fight, pick one of three cards, and continue. At first it’s just fun to see what all the cards can do, but you quickly start to see potential builds and synergies across a character’s card set. The way Slay the Spire imagines character classes—as a series of potential decks within a themed collection of cards—is genius. It’s delightful to discover the deadly shiv combos lurking in the Silent’s card set. With some luck, it feels awesome to unlock the Defect’s potential for scratching enemies to death with a barrage of blows. If the devs end up releasing card expansions or new classes I would buy all of them. The heavy randomisation can doom a run every so often, but the game presents enough choices to at least trick me into thinking I stand a chance. Shops provide an essential chance to seize control and push a build in a certain direction, especially if I have enough gold to discard a card from your deck and pick a relic. Relics deserve a ‘Why I love’ article all of their own. Their powerful effets can distort the rules of the game for an entire run. Some inflict negative effects, but there tends to be a trade off. One relic might generate curses, another might eat curses to heal you. These magic trinkets can change the entire direction of a build, and the developers keep sneaking new ones in. I don’t think there’s much chance I’ll tire of Slay the Spire in 2019, which is impressive because I’ve put 24 hours into it already. Steam Workshop support suggests we might start to see user-generated cards, and I’m sure there are more updates planned after launch. Jump in now before it hits full price in January; it’s worth it.